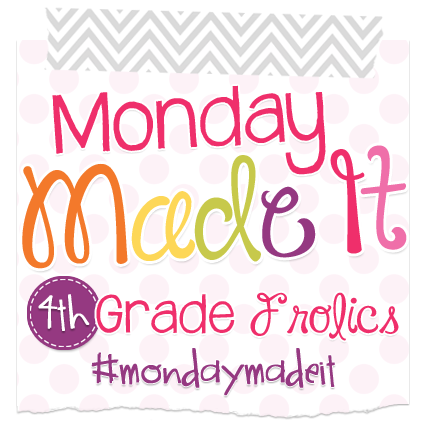 Welcome back to another Monday Made It hosted by the lovely Tara at 4th Grade Frolics! Hopefully it will be the solution to end my craft fails! During this series, I am going to take an everyday object and totally transform it into something new. I knew I just had to make some fancy new wall art for the classroom! If you are like me, you fall in love with wall art at places like Hobby Lobby only to discover it costs upwards of $30 for a single canvas. 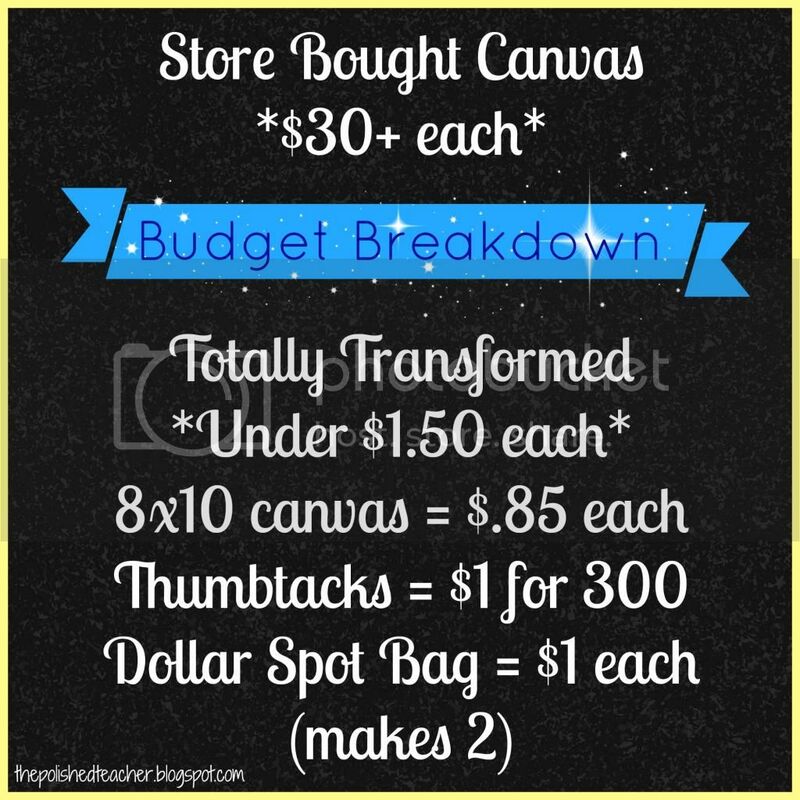 Have no fear, I am here to show you a much cheaper way to get top notch wall art! For the final product, each canvas cost under $1.50 to make after using coupons. Feel free to pin any of my Monday Made It creations on Pinterest that you might like to tackle in the future! We all know it is where most of my crafting ideas come from! 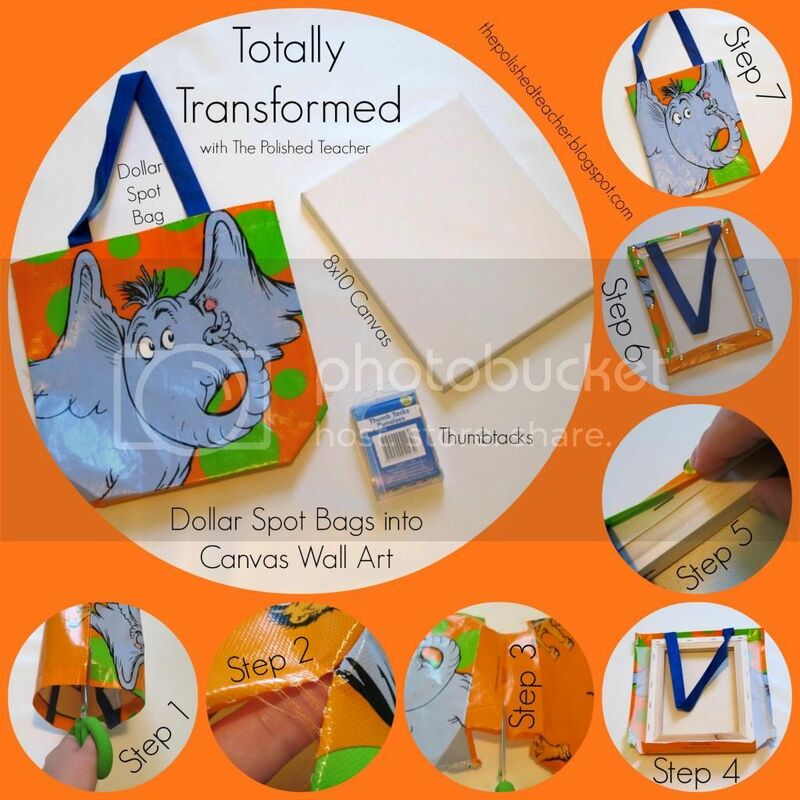 The process to turn these canvas bags into wall art takes just a few simple steps. 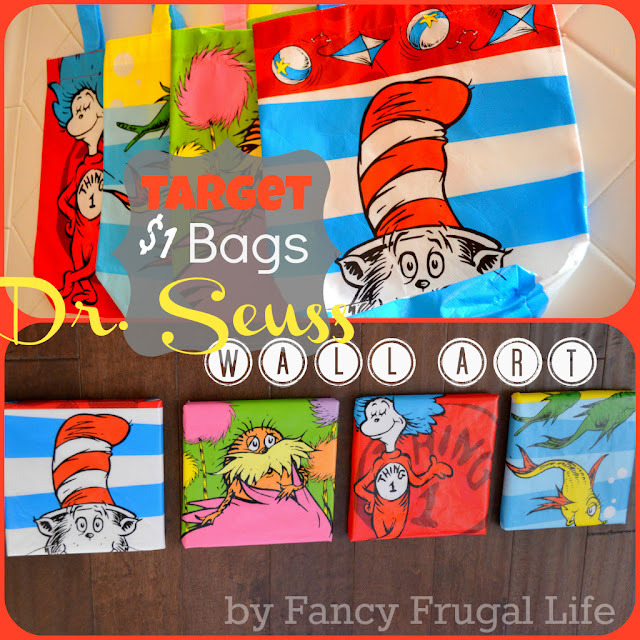 If you are a teacher hoarder and Target fanatic like myself, odds are you will have all these things at your disposal. As you can see, I had a newer (2014) and older (2013) version of each bag. I know I have the original (2012) bags from the Pinterest page if I dig through my closet hard enough. I have been diligently collecting these bags at Target. I always buy at least 2 of each bag when I go to the Dollar Spot because I never know when I might need more than one and they are always sold out. 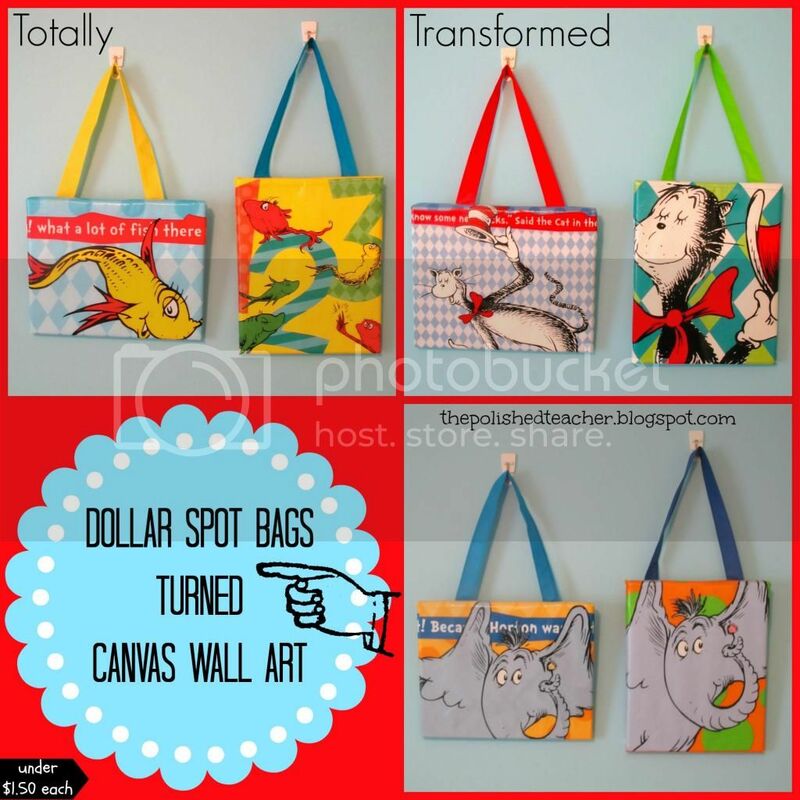 Good thing I bought duplicates because now I have beautiful wall art and bags to use in the classroom. I cannot wait until the new set of bags come out so I can continue to add to my collection! Hope you enjoyed this tutorial! Thanks to Fancy Frugal Life for the inspiration for this project! See you next week when I tackle another Totally Transformed project! Super cute! I am always in awe of what inspires people...you did a beautiful job! Love, Love, Love!!! I cannot tell you how many times I looked at those bags at Target and thought "I want this, but do NOT need another bag!" Great idea. This is a fantastic idea! 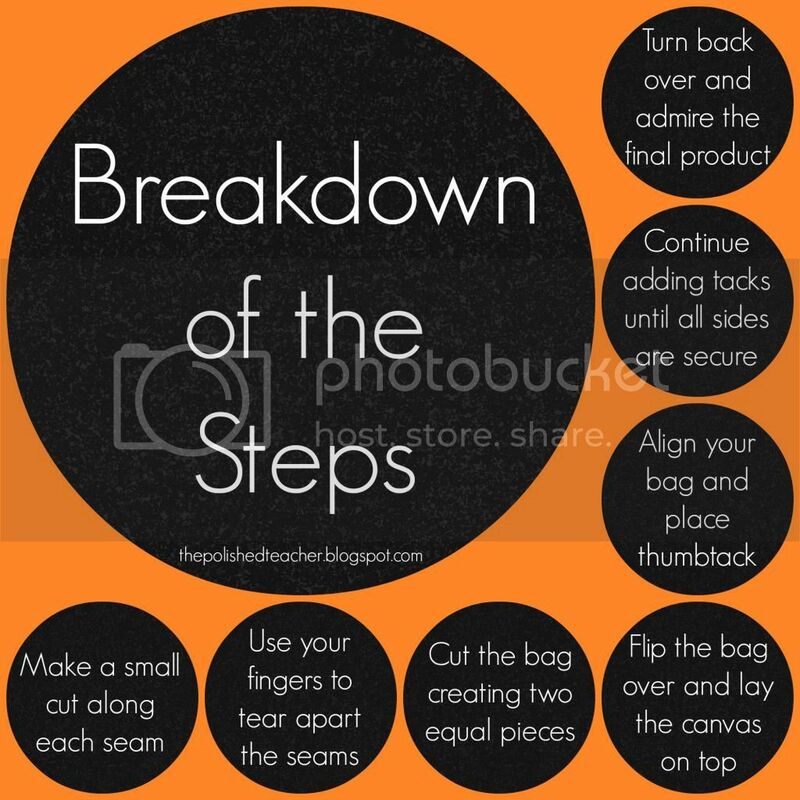 Super easy way to add some art into the classroom. One question... where did you find the canvas? I have looked at stores in my area and they are at least $5-10 each! Super cute idea! What a great way to upcycle bags. Adorable!! I just love these. Such a great idea - thanks for sharing! Those are adorable! I've never seen those bags in my Target. I'm going to keep looking, though! Probably scooped up quickly by other teachers in the area. Happy Summer! These are super cute and I would have never thought to have use the bags in this way.